Neuromuscular scoliosis (NS) is one of three commonly distinguished forms of scoliosis. It is caused by abnormal formation of the spinal bones and spinal nerves, as well as their connection to spinal muscles, causing deformity of the spine. There are varying levels of this type of scoliosis and unfortunately, the curve progression, or abnormal formation of the spine is usually much more pronounced than in idiopathic forms of scoliosis. This form of scoliosis affects many thousands of people since it has numerous causes. Muscular Dystrophy – A set of diseases that affect the musculature of the body and inhibit correct ambulation. Friedrich Ataxia – A genetic disease that causes damage to the nervous system, and thus the spinal nerves and their proper functioning. Cerebral Palsy – Another group of diseases that cause non-progressive motor inhibition. Skin breakdown due to insensate skin. 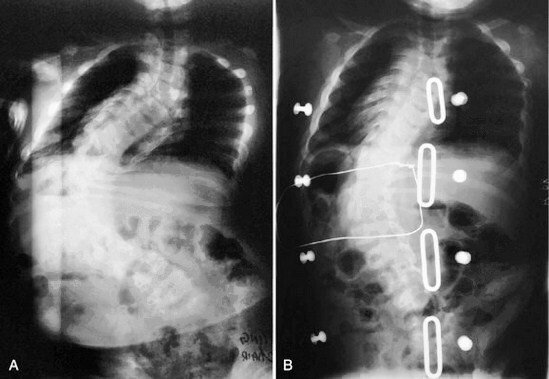 Neuromuscular scoliosis can be helped with surgery, since bracing does not usually correct spinal abnormalities, as it can in some cases of congenital scoliosis, although it is sometimes tried as a first response to symptoms. A wheelchair or supportive seat may also be utilized to support the spine and torso. Orthosis equipment, like soft bracing may be used to help support the thoracic and lumbar spine. When supports are used, they are usually employed prior to puberty. The fast growth spurt that usually accompanies the transition from child to adult results in the inefficacy of said equipment. It simply cannot keep up with the progression of the spinal curve or abnormality with such fast growth of the bones, muscles and nerves. Surgery is used to halt or slow progression of neuromuscular scoliosis, and aids in helping patients to sit or even stand without help, increases ambulatory functions in patients overall, and decreases pain significantly. X-rays and MRIs are usually used to plan surgery and diagnose the severity of the disease. As with other forms of scoliosis, the earlier the detection of the abnormal progression of spinal growth, the easier it is to treat the anomalies that develop. Dentist in Oakton VA cosmetic Dentist vienna price contact in Oakton.